Designation: Postdoctoral Research Associate at University of Nebraska Medical Center. Research Interest: Biochemistry, Cancer Biology, Cell Culture, Glycobiology, Oncology, Cellular & Molecular Biology, and Protein Biology. Biography: Dr. Srikanth Barkeer is a Postdoctoral Research Associate at University of Nebraska Medical Center, Nebraska, USA. He was a Research Scientist-I at Karnataka Institute of Medical Sciences, KA, India in 2015, PhD Research at Karnatak University, KA, Indi in, 2011. He received his doctorate in Biochemistry, Faculty of Science and Technology at Karnatak University, KA, India, M.Sc. in Biochemistry at Karnatak University. Postdoctoral Research Associate, UNMC, Omaha, USA, 2016. Research Fellowship, Agilent Technologies Project, Karnatak University, 2014. Qualified Karnataka State Eligibility Test for Assistant Professorship, Mysore University, 2014. Ph.D. Fellowship, DBT- KUD Interdisciplinary Program of Life Sciences for advance research and education, Karnatak University, 2011. Senior Research Fellowship, Department of Biotechnology, Agricultural Research Station, University of Agricultural Sciences, 2009. Mohan, T.C., Savita, S.G., Srikanth B., Varada, B., Vamadevaiah, H.M., Khadi, B.M., and Katageri, I.S. (2011). Identification of genes responsible for fibre elongation during early cotton fibre development by suppression subtractive hybridization. World Cotton Research Conference-5 held on November 7-11th 2011 in Mumbai, India. Savita, G., Hari Krishna., Srikanth B., Anupama, S., Vamadevaiah, H.M., Khadi, B.M., and Katageri, I.S. (2011). Validation of SSR markers linked to fibre related traits in cotton. World Cotton Research Conference-5 held on November 7-11th, 2011 in Mumbai, India. Sachin M. E., Radha P., M. A. Savanur., Nagaraj N. N., Srikanth B., Vishwanathreddy H., Arvind I., Rajiv D. k., Bale M. Swamy., Padma Shastry., and Shashikala R. Inamdar (2013). Rhizoctonia Bataticola lectin (RBL) induces apoptosis in human ovarian cancer PA-1 cells and suppress tumor growth in vivo. 32nd Annual Convention of Indian Association for Cancer Research (IACR) held on Feb13th-16th, 2013 in New Delhi, India. 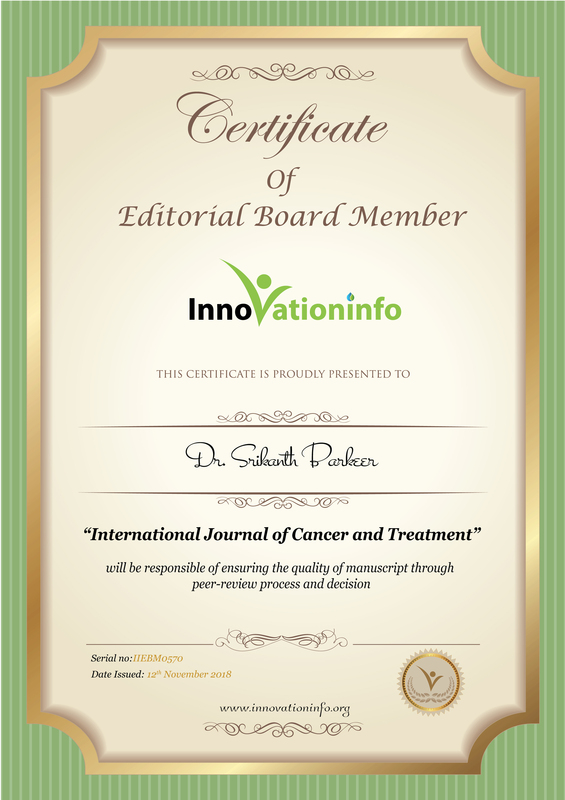 Sachin M E., Radha P., M. A. Savanur, Nagaraja N. N., Srikanth B., Aravind I., Rajiv D. K., Bale M. S., Padma S., Shashikala R. I. Rhizoctonia Bataticola Lectin (RBL) Induces Apoptosis in Human Ovarian Cancer PA-1 Cells and Suppresses Tumor Growth In Vivo. 32nd Annual Convention of Indian Association for cancer Research & International symposium: Infection &Cancer” organized by Dr. B. R. Ambedkar centre for Biomedical Research (ACBR), University of New Delhi held on February 13-16, 2013. Ravindra G., Sachin M. E., Srikanth B., Jonathan M. R., Lu-Gang Y., Bale M. S., Shashikala R. I. Identification of SRL binding receptors on human colon cancer cells using micro-fluidic based LC system with an advanced QTOF MS. 61st ASMS Conference on Mass Spectrometry and Allied Topics to be held on June 9 - 13, 2013 at USA. Srikanth B., Arun K. S., Nilanjan G., Ravindra G., Deepak S. A., Jonathan M. R., Lu-Gang Y., Bale M. S., Shashikala R. I. Identification of pathways leading to HT29 cellular apoptosis following SRL interaction. Glycobiology of Cancer; Lectins as Tools and Targets GCLTT 2013 organized by Post-Graduate Department of Studies in Biochemistry, Karnatak University, Dharwad held on November 7-9, 2013. Nilanjan G., Ravindra G., Srikanth B., Deepak S.A., Arunkumar P., Shashikala I. Identification of Apoptosis Inducing Signaling Pathways and Characterization of Sclerotium rolfsii Lectin (SRL) Binding Proteins from Human Colon Epithelial Cancer HT29 cells. Experimental Biology 2016 Meeting, April2-6, 2016, San Diego, USA. Saswati K., Srikanth B., Dario G., Moorthy P. P., Surinder. K. B. PD2 functions as the master regulator of stem cell network genes in pancreatic cancer. Biochemistry and Molecular Biology Annual Symposium, August 10, 2017, UNMC, Omaha, NE, USA. Srikanth B., Seema C., Saswati K., Satyanarayana R., Surinder K B., Moorthy P P. Differential glycosylation of cancer stem cell markers maintain the stemness in pancreatic cancer. Biochemistry and Molecular Biology Annual Symposium, August 10, 2017, UNMC, Omaha, NE, USA. Saswati K., Srikanth B., Dario G., Moorthy P. P., Surinder. K. B. PD2 functions as the master regulator of stem cell network genes in pancreatic cancer. APA (American Pancreatic Association) Annual Meeting, November 8-11, 2017, San Diego, CA. Chugh S, Barkeer S, Rachagani S, Nimmakayala RK, Perumal NK, et al. (2018) Disruption of C1galt1 Gene Promotes Development and Metastasis of Pancreatic Adenocarcinomas in Mice. Gastroenterology. Barkeer S, Chugh S, Batra SK, Ponnusamy MP (2018) Glycosylation of Cancer Stem Cells: Function in Stemness, Tumorigenesis, and Metastasis. Neoplasia 20: 813-825. Barkeer S, Guha N, Hothpet V, Adavigowda DS, Hegde P, et al. (2015) Molecular mechanism of anti-cancer effect of Sclerotium rolfsii lectin in human colon cancer HT29 cells involves differential expression of genes associated with multiple signalling pathways; A microarray analysis. Glycobiology 25: 1375-1391. Barkeer S, Gudihal R, Eligar SM, Hegde P, Yu L, et al. (2015) Identification and characterization of Sclerotium rolfsii lectin (SRL) binding proteins from human colon epithelial cancer HT29 cells. Translational Biomedicine. Eligar SM, Pujari R, Savanur MA, Nagre NN, Barkeer S, et al. (2013) Rhizoctonia Bataticola lectin (RBL) induces apoptosis in human ovarian cancer PA-1 cells and suppresses tumor growth in vivo. J Glycobiology. Pujari R, Eligar SM, Kumar N, Barkeer S, Hothpet V, et al. (2013) Rhizoctonia bataticola lectin (RBL) induces caspase-8-mediated apoptosis in human Tcell leukemia cell lines but not in normal CD3 and CD34 positive cells. PLoS ONE 8: e79311. Barkeer S, Burdekar V, Sangannavar P, Mohan TC, Vamadeviah HM, et al. (2012) Temporal and spatial expression of flavonoid biosynthetic genes in petals of cotton. J. Cell and Tissue Research 12: 3149-3155. Sangannavar PA, Hegde PM, Choudki VM, Savita SG, Vanti GL, et al. (2012) In vitro and in vivo studies on induction of multiple shoots and regeneration in cotton (G. arboreum L. AND G. barbadense L.). J. Cell and Tissue Research.